The verse ".....is my name and with my needle I wrought the same" was the inspiration for my company name. I hope you'll enjoy stitching my designs. How much fun it was to receive these photos from Marjie T. who lives in Maine. Marjie and I met in person a few years ago at the Ackworth seminar. Marjie has stitched Mrs. Waddelow's Huswif (and needlebook) and Mrs. Waddelow's Basket (and accessories) all in blue!! By now you probably know that I am a blue person (look at some of my older designs), and so is Marjie. 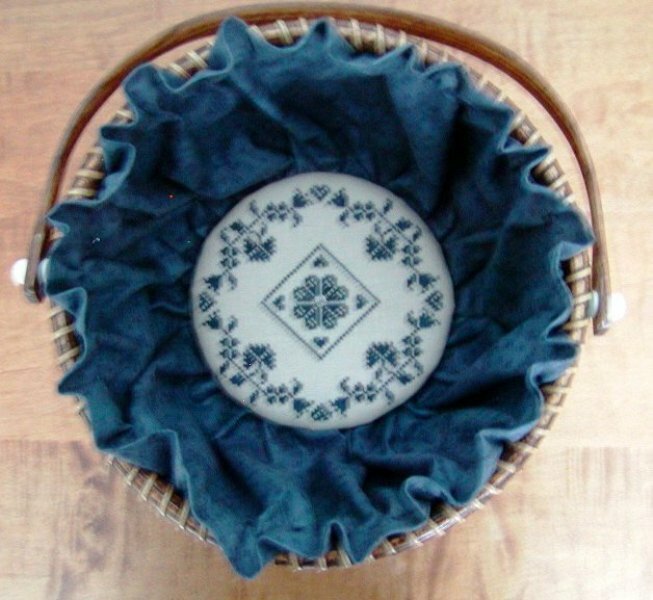 Marjie's finished basket is the first I've seen so I was particularly excited to see hers. Marjie wrote, I used the linen called for in the pattern but substituted WDW "twilight" because I am a blue person. I did all but the basket center in one strand, regular cross stitch. For the basket center, I just grabbed the pattern and the linen and floss and headed off to an EGA meeting where I blithely started stitching as I normally would- 2 strands on 32 count. Actually, I think it looks better in the bottom of the basket that way as it shows up against the fabric I chose. Here is a view of the outside of Marjie's huswif. And look at the lovely fabrics she chose for the inside. Aren't they beautiful? In this photo you can also see her needlebook and scissors pocket. Marjie, thank you so much for sharing photos of your beautiful work. I hope our paths will cross again soon. I'd particularly love to see some of your weaving. So inspiring to see another Mrs Waddelow finish, I really must get started on her this year, but then I have a class or two lined up soon and I'm sure they will keep me busy. Oh how beautiful! Marjie did a fantastic job with everything! Happy Valentine's Day Ellen. 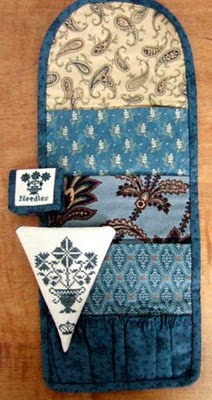 Please visit us also on the With My Needle FACEBOOK page. Visit my website to see all my designs. Please send photos of any of my designs you have stitched to me at examplar@withmyneedle.com. The ideal photo size is 640 pixels in the largest dimension. I don't always get notifications when a note is left in my guestbook, so if you have a question it is best to email me directly. More details and photos of my teaching projects are at my website. © 2009-2016, Ellen Chester. Powered by Blogger.